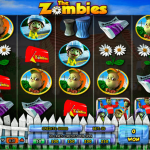 The Zombies, video slot game from Amaya Gaming is quite refreshment. These zombies are really nice and they will award you with huge prizes if you help them defeat the bad zombies. We have an American family in front of us that create quite pleasant atmosphere. There are 2 spin buttons where one of the offers possibilities of winning big but not very often, and the other one offers small wins but more often, and it is up to you to decide which one you want to play. As we mentioned before there are 2 modes you can play the game with different symbols, but the special features are the same for both of them. The Zombie Dance Party symbol is the scatter and it activates the free spins round. 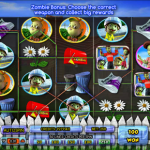 You need to land 3 symbols at least to receive 10 free spins and every time a parent or bad zombie appears you can win a multiplier too. The Parent and Bad Zombies are bonus symbols and when they appear on adjacent reels they activate the bonus game. You will need to hit as many zombies as you can here and if you do not manage to hit any you will receive a consolation prize of 9x bet. The Zombies is a very interesting game that is fun to play. Amaya has done an amazing job when it comes to the design of the game. We loved how the background and the symbols can change with every spin you take. The special features are also fun to play, especially due to the fact that they can be quite lucrative. We advise you to give this game a chance and we are sure you will enjoy playing it the same way we did. For a high speed adventure consider playing Taxi! a 5 reel slot by Amaya.